Marks & Spencer customers were left fuming last night after logging into their online accounts to find other users’ personal details. 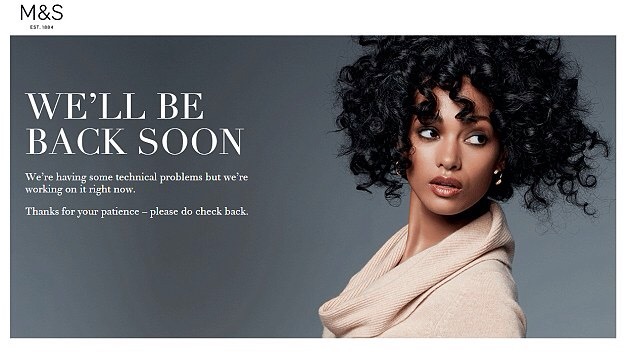 The London-based retailer, which has more than 1,300 stores worldwide, temporarily suspended its website while the ‘technical issue’ is investigated – but strongly denied it had been hacked. Customers claimed they could see order histories, personal addresses and other details of different account holders online when they logged on to register new ‘Sparks’ reward cards. Helen Jones, from Oswestry, told the MailOnline she was horrified to log into her account and find that someone had ordered three items in a completely different size. She said: ‘I had gone out during the day and was given this card to join the scheme, a Sparks card. ‘The site was really a bit iffy and I couldn’t get to register the stupid card. I must have tried about 15 times. I went into the My Account section to change my password and it showed I had ordered three garments – not in my size – which came to around £45. ‘I hit the page with personal address, and I could see the name, date of birth, address, email, postcode and mobile number of a different woman. ‘It has given me great reservations. What if my account details are being bandied around left, right and centre? It is a huge data protection issue, especially off the back of what happened with TalkTalk. Meanwhile customer David Collier from Bournemouth said last night that his girlfriend had created an account and was ‘presented with five other people’s account details’. A spokeswoman for the company said: ‘Due to a technical issue we temporarily suspended our website last night. Posted on October 29, 2015, in #retail, #uk. Bookmark the permalink. Leave a comment.